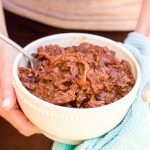 This gluten-free bourbon bbq shredded beef recipe is a magical combination of juicy beef in a garlic and onion barbecue sauce, placed in your slow cooker along with a dash of bourbon, and ready for your enjoyment after a busy day! I think it is no secret that I love slow cooker meals. Between this chicken and dumplings recipe, this spicy sage turkey recipe, and this gluten-free beer cheese soup recipe, I have my favorites. That’s why it’s so surprising that it has taken me so long to get this favorite of mine up on the blog! I had actually thought that I had it up on the blog but it really wasn’t and felt I was doing an injustice to society for not sharing the recipe! 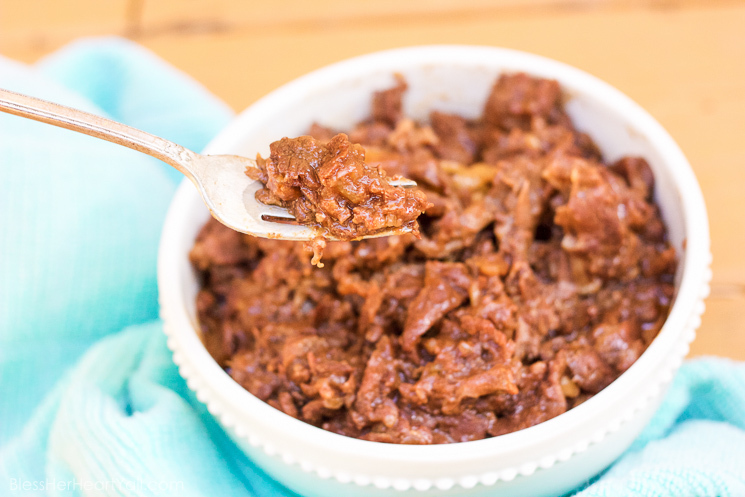 This bourbon BBQ shredded beef recipe has been a long time favorite of mine, not only because it is slow cooker so ya toss in the ingredients and let it go all day, but the flavors that come out of this dish are amazing! It’s savory, it’s tangy, it’s a bit sweet. It’s amazing! It’s tender, it’s saucy, it’s juicy. Did I mention that it’s amazing? Pair it with some state fair pickles, The Best Homemade Potato Salad from Meaningful Eats, and a cold glass of lemonade! With spring and summer barbecue season around the corner, my “go-to’s” for supplying parties worth of hungry people are barbecue sandwiches. They are easy to serve up, are tasty with an easy salad and chips, and who doesn’t love pulled barbecue? 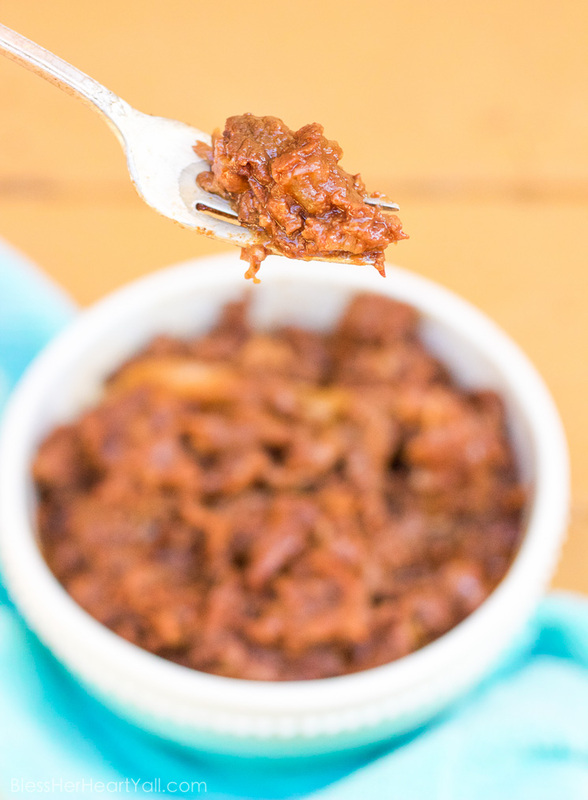 I like to make a ton of this bourbon bbq shredded beef, not only to have in my sandwiches, but on salads, in tacos, casseroles, and even lettuce wraps. The possibilities are endless! I have even frozen this stuff into smaller portions and frozen it for later use. Oh the possibilities! And if you don’t want to serve this dish that has alcohol in it, no prob! This dish is still amazing tasting even without the bourbon. You will still get amazing results that are drool-worthy! 1.5 - 2 pounds of boneless beef of your choice cheaper cuts are okay here as it is slow cooked all day! Line your slow cooker with a slow cooker liner for easy clean up. 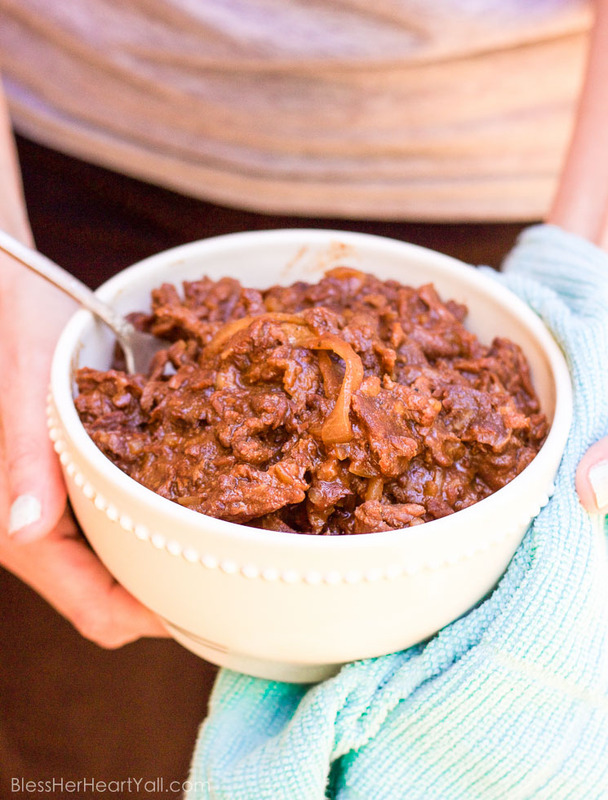 Combine all ingredients (except the beef) in the bottom of the crockpot and stir to mix well. Place the beef in the crock pot and spoon sauce all over the meat. Sounds amazing! I am now craving this, so might have to make a batch very, very soon! Nice! Hehe! I think you will love it! Oh yum, this would be great in a sandwich! Love the flavour combo – perfect for bbq season!! Oh it’s such a good sandwich! It’s perfect for parties and large get togethers too because everyone loves the flavor and the tenderness of the meat. You got me at bourbon 🙂 Then again at barbecue sauce. Then again at slow cooker! This dish is a winner can’t wait to try it! This looks delicious! My family would be all over this dinner. We eat something similar as a meal on a bun. So yum! The bourbon is a new twist. I’ll have to try it! thanks so much for the recipe! Well bourbon makes everything better. I don’t like drinking it but love cooking with it. This sounds awesome….perfect for a crowd…to make awesome sandwiches. I agree! Cooking with bourbon makes anything better! The taste of this dish is amazing! 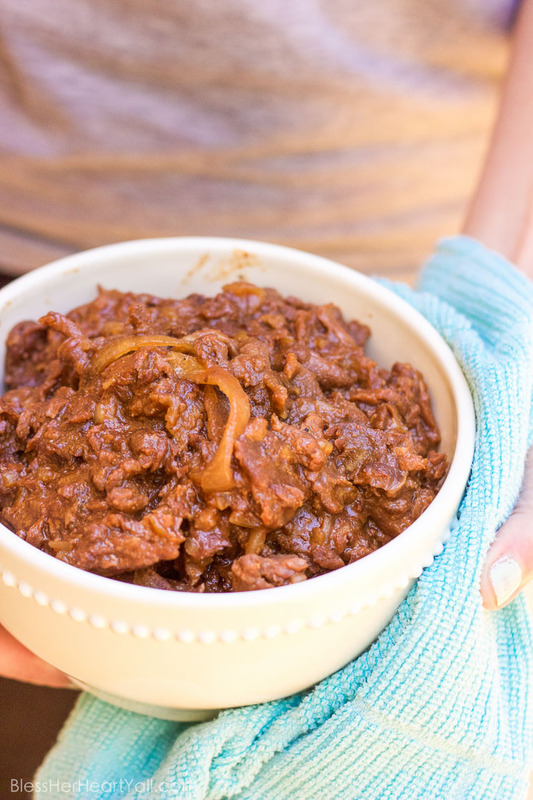 I love slow cooked meat, seasoned and simmered like that – melt in your mouth! You’re right! It’s so juicy and just fall apart! Mmmmmmmmmmm! You got me at bourbon (NOT optional lol). This looks really delicious. And slow cookers are awesome aren’t they? Put everything in a pot then come back to a wonderful smelling kitchen. This is definitely a must-try. Pinned for later! My husband is going to love this one. It’s definitely been “hubby approved” in my house! Hope he likes it! This looks so lovely and delicious, especially after a long day when you really want dinner to be satisfying! Oh it is so good! An easy meal for after a long hard day!